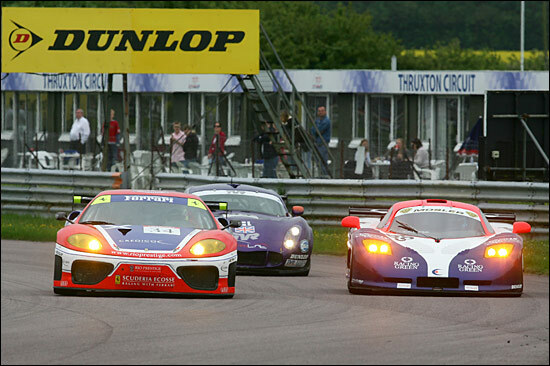 After a start to the 2005 season that would turn hair grey on the staunchest of scalps, Eclipse returned to the British GT Championship at the dauntingly fast Thruxton Circuit with their new look team on parade. The #69 Mosler MT900R has now been given the full Eclipse treatment, with a dayglo orange roof area presenting a dramatic look for the big V8 GT2 car. 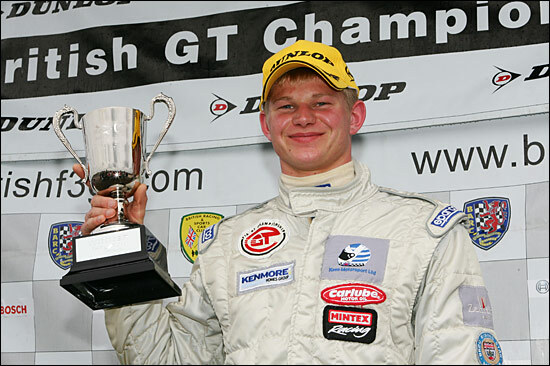 Young gun Philip Keen will join Eclipse returnee Steve Hyde aboard the Mosler for the remainder of the 2005 season, the 20 year old impressing the team with a fabulous display at the Silverstone round of the FIA GT championship. After bad luck in both qualifying sessions (a leaky damper meaning the Mosler was not handling as it should), it was seventh place on the grid for Phil Keen, soon to become effectively sixth when the #34 Ferrari broke a driveshaft forcing a second green flag lap. Up ahead of the Eclipse car there were problems for the Embassy Racing Porsche after contact with a TVR, Keen passing the 911 with ease as Neil Cunningham struggled back with a puncture, Eclipse up to fifth before the end of lap 1. The Eclipse man was by now fully engaged in battle with the second new Mosler in the race, Gavan Kershaw defending well for three laps before Keen found a way by for fourth place. There was further drama not far ahead as the leading car, the #35 Ferrari, spun on oil left by an errant GT3 Porsche. 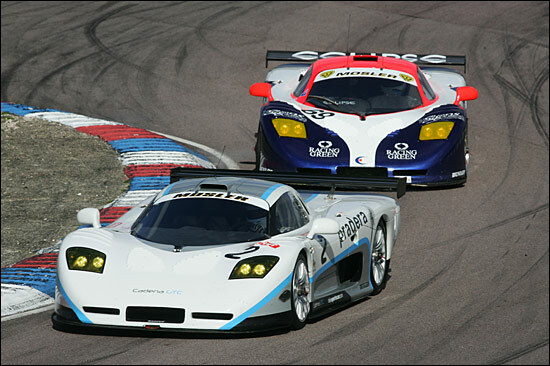 Both the LNT TVRs and the #69 Mosler powered by before the Ferrari could rejoin. It was early days, but Eclipse were in a podium position already. 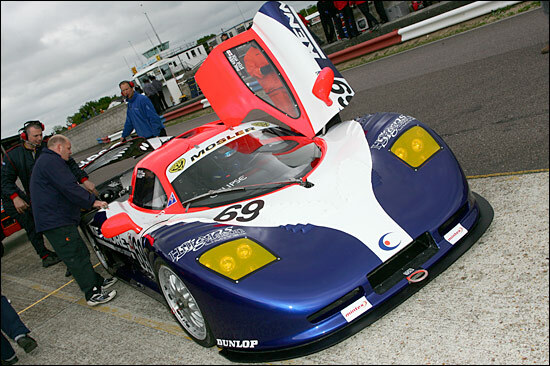 Next time around, with 10 minutes of the race elapsed, Andy Thompson in the second placed TVR was defending from Keen, the TVR man had a big lock-up into the chicane and Keen was through up the inside with a move that required skill, bottle and quick reactions in equal measure – the Mosler now up to second overall. He wasn’t done yet though. Just a couple of laps later the #69 Mosler was right on the tail of the race leader and pulled an almost identical move on Pearce to that which had foxed Thompson a few laps earlier. 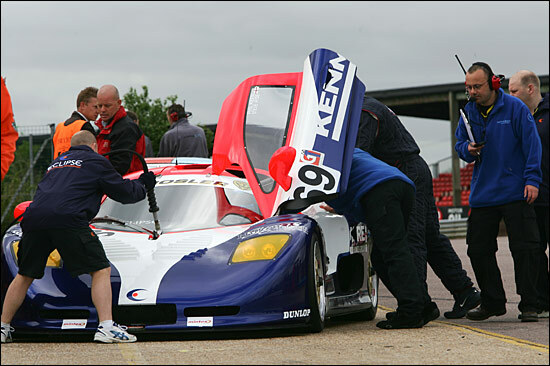 Pearce left it very late to brake and turn in, finding as he did so that the inside line was already occupied by a large American GT car: the TVR was forced to cut the chicane, and lost momentum and speed. 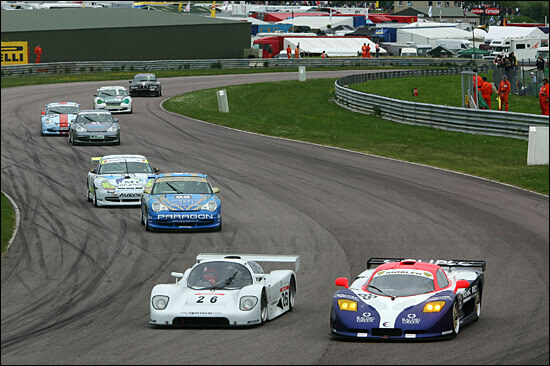 Eclipse Motorsport was in the lead of the race in the championship debut of both the Mosler and Phil Keen. Gavan Kershaw meanwhile had been dropping back steadily with an evil handling Mosler: the fight finally got the better of him at Noble, the Cadena GTC car spun and stalled in a dangerous position, and with 20 minutes gone a Safety Car would be required to move the car safely their breath. This all meant that the pit stop window opened under a full course yellow. The leading runners couldn’t afford to leave it to chance that they might have to pit under green and almost the whole GT2 field came rumbling down the pitlane together. Eclipse pitted from the lead but the team opted for a conservative approach, checking the Mosler over before sending Steve Hyde out, now back in third position behind the #35 Ferrari and #43 TVR. The surprise package of the race was the much improved form of the Nissan 350Z. 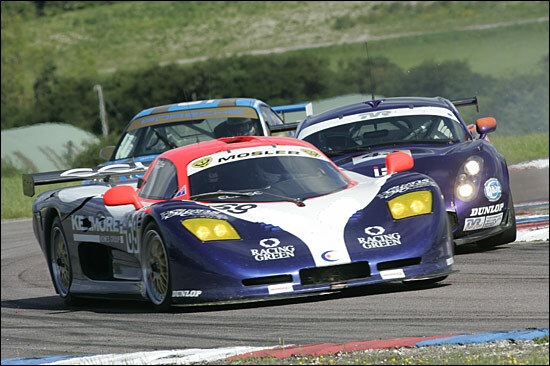 Great news for RJN Motorsport, bad news for Eclipse as the Nissan bustled by the #69 Mosler at the 30 minute mark. With the lead battle decided in the Ferrari’s favour the remainder of the race for Eclipse would see Steve Hyde struggling with a set-up he was uncomfortable with, on one of the most demanding circuits in the UK. He would eventually finish in a highly respectable sixth place, a great springboard for Sunday’s 60 minutes of action - but with one distinct wrinkle! The wrinkle was that the Mosler’s qualifying problems had proved far worse in the second 15 minute Saturday session. The result? Steve Hyde was starting back in 23rd place. The good news though was that the team had adopted a set-up for Sunday that would enable both drivers to push harder. Hyde was immediately on the attack and made steady progress up through the order and into the battle for the GT3 leaders, before the pit window opened. Steve was amongst the first to take advantage, Phil keen living up to his surname and rumbling back out into the race after a slick stop from the Eclipse team, down to 12th place for now and closing in on the Cadena Mosler ahead. With the leading Ferrari haring away at the head of the race, it seemed that only its sister car could challenge for the win. A broken starter put paid to that challenge, and allowed the Moslers to make up ground on the #34 car, Chris Niarchos now at the wheel. Philip Keen meanwhile had gone by Gavan Kershaw, the Eclipse man now up to fourth place, his pace leapfrogging the Mosler ahead of others as they pitted and reeling in Niarchos fast: two laps later and the Eclipse newcomer was up to third, 43 seconds behind Thompson’s TVR, the T400R 38 seconds behind race leader Nathan Kinch. Phil Keen was by now fully up to speed and pressing hard to try to reduce the gap to the TVR. He unlapped himself from Kinch in the process and drew away easily from the Ferrari, fending off a further challenge from the second Mosler as he did so. The TVR ahead meanwhile seemed to be struggling under braking and, as the clock showed just two minutes remaining, the TVR was spotted crawling into the chicane, a blow out on the front left taking most of the bodywork on that corner with it. 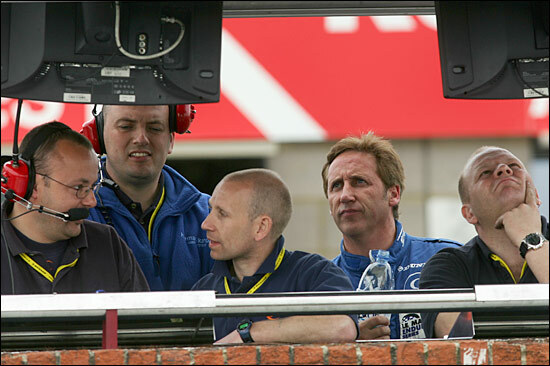 There were some interesting expressions on the pit wall. 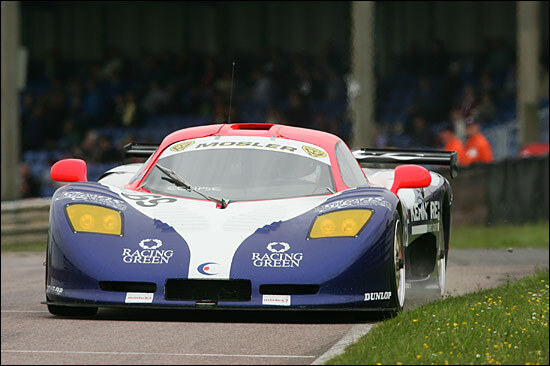 Keen hurtled by the TVR as it struggled through the chicane and started the last lap of the race in an astonishing second place, with Kershaw’s Mosler inheriting third spot. A weekend of renewed hopes then for Eclipse. A Mosler that proved capable of mixing it with the class of the field, the team leading the race on Saturday and completing an astonishing run from 23rd on the grid for Sunday’s race to second place by the chequered flag. 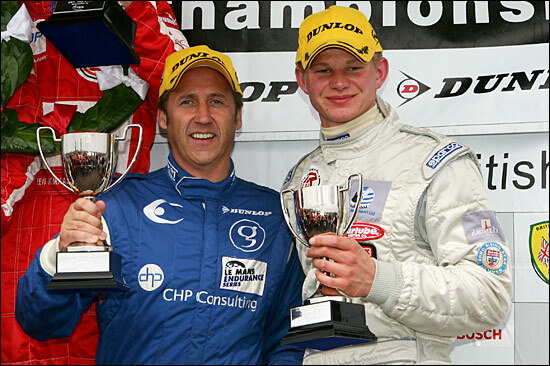 Steve Hyde pronounced himself far happier with the car on Sunday and clearly impressed with his new young team mate. For Phil Keen, his efforts were recognised with the award of Sunoco Driver of the Weekend. Castle Combe in a month’s time should be very interesting indeed.